Whew, this is an odd story with a lot to unpack. Let’s start at the beginning. Over 100 years ago, two drivers Nagel and Mikhailoff competed in the 1912 running of the Monte Carlo Rally in their Russo-Baltique (shown below). The car did not win, but its ability to finish has inspired decades of pride from the region. Anyway, Dartz allegedly charged $1.3 million for the privilege of ownership, calling it the ‘most expensive vodka bottle in the world’. The vodka inside was distilled using fresh snow from the French alps. That bottle of 1.3 million dollar Vodka was stolen last week from a collection in Copenhagen, Denmark. Cafe 33, a pub in the city center, had collected a collection of fine spirits, and the bottle was on indefinite loan to the bar’s owner Brian Ingberg, from Dartz. On Tuesday night, a masked thief used a key to enter the basement bar and singled out the bottle for lifting. A few days later, the bottle was found. It’d been left somewhere it would be found, and was turned over to the police immediately. It had been emptied of its contents, and at some point had been dropped and the precious metal canteen was dented. 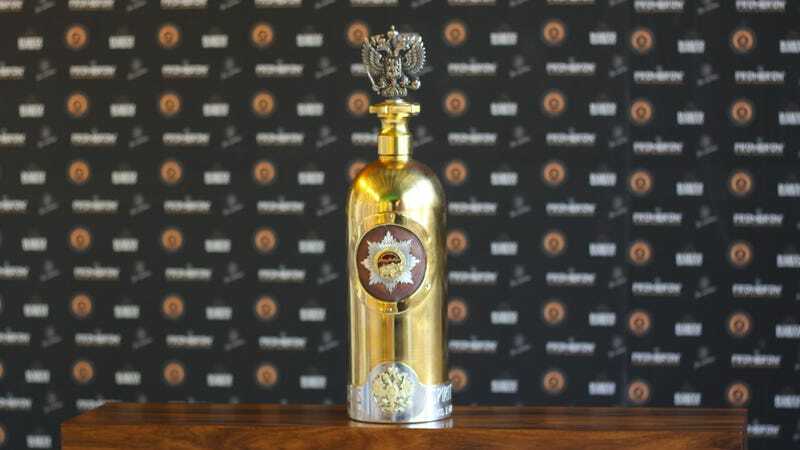 Above is a photograph of the $1.3-million vodka with Russo-Baltique’s “most expensive caviar in the world.” Kind of makes a Range Rover look like a Toyota Tercel.